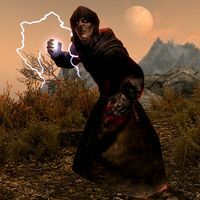 The Traveler is a vampire you may randomly encounter throughout Skyrim, including within cities. He is initially unaggressive when you encounter him, but turns hostile when you get close. He attacks using various magic spells, including Summon Gargoyle. He wears hooded black robes, vampire boots (armor version), and vampire gauntlets. When he dies, he drops vampire dust, as well as some various potions. This page was last modified on 27 August 2015, at 05:18.